You are here: Home>Archive>Olney Rugby Union Football Club>Olney rugby team photographs from 1877 to date>Olney RFC youth team, 1974/75. Olney RFC youth team, 1974/75. 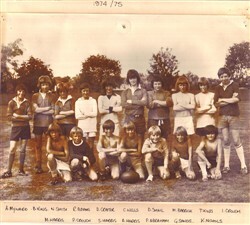 Olney Rugby Union Football Club youth team, season 1974-75. Players listed as A. Maynard, B. King, N. Smith, R. Adams, D. Crafter, C. Wells, D. Smail, M. Barrick, T. King, I. Crouch, M. Harris, P, Crouch, S. Harris, A. Harris, P. Abraham, G. Sands, K. Nichols.